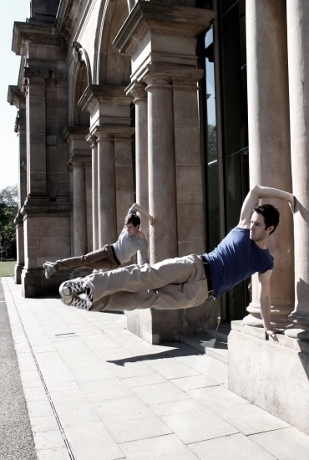 Dundee is home to Scotland’s National Contemporary Dance Company, otherwise known as Scottish Dance Theatre (SDT). Since its beginnings in 1986, when it was then known as Dundee Rep Dance Company, its gone onto win a string of awards and is recognised at home and abroad for its originality and contribution to dance as an artform. Originally from Norwich, Toby Fitzgibbons has been based in Dundee as part of SDT for the past 8 years. Performing in “Letters from America” on November 15 at Dundee Rep, Toby gave creativedundee.com an insight into his working life and his involvement with a new project for 2012 which celebrates Dundee’s relationship with dance. SDT is has its own studios and offices within Dundee Rep theatre, where I’m based when not touring with the company. What path did you follow that led you to being a part of SDT? I studied dance and musical theatre at Bird College in South-East London from the age of 16 to 19 where I discovered ‘pure dance’ more commonly known as contemporary dance. I went on to do an apprenticeship with SDT because they showed passion for dance that spoke about what matters, before joining the company permanently a few years later. I’ve always taken inspiration from the people around me. Janet Smith, the Artistic Director of SDT has always been a massive part of my dance life. Art, films, politics and history are a constant. I visit art galleries whenever I can – the Tate Modern is a favourite. I’m interested in the world and politics and what it’s like to be alive today. It sounds silly, but for me dance and theatre is the place for this expression. Dundee’s historic and beautiful decaying buildings also colour my thoughts on the way to work! What would you say as been your career highlight or breakthrough moment ? I’m not sure ‘break-through’ moments are for me or will be part of my dance career. However, when I got the job with SDT I didn’t sleep for a week! Shows in far away places like China are very special. Duets and favourite pieces like Luxuria by Liv Lorrent and Dog by Hofesh Shechter will always remain landmark moments. We are touring and rehearsing Letters from America taking it out on the road to large and small venues across Scotland. As well as creating a new work for children called What on Earth!? choreographed by Janet Smith and Sally Owen (Assistant Director at SDT) which will premiere in April 2012 at Dundee Rep. I’m a toad in it! What are your favourite places to hang out or visit in or around Dundee ? I love DCA. Dundee is really lucky to have such a place, especially the cinema, which shows films which wouldn’t be seen in Dundee if we only had “big cinemas”. The McManus Gallery’s recent renovation has revealed an architectural treasure for the city. I enjoy Dundee’s parks; a walk around Baxter Park near my flat is always refreshing, or Tentsmuir or Broughty Ferry for a nice retreat from the city. What’s next for you and SDT? Soon we will begin work with Rachel Lopez de la Nieta for a new work called Pavlova’s Dogs which will premiere next February at Dundee Rep. And I’ll also be re-working a piece I have made with Matthew Robinson (another dancer with the company) to be performed in London early 2012. An ongoing project for Scottish Dance Theatre is something we call ‘The Grand’, and at this point we are collecting the stories of Dundonian’s experiences of dance in the city. It is really interesting to hear how rich the history of dance is in Dundee, especially the tradition of the city’s dance halls. Remember why you are doing what you do and that talent is only part of it, mostly it’s lots and lots of hard work! Letters from America is on at www.dundeerep.com on 15th November 2011.